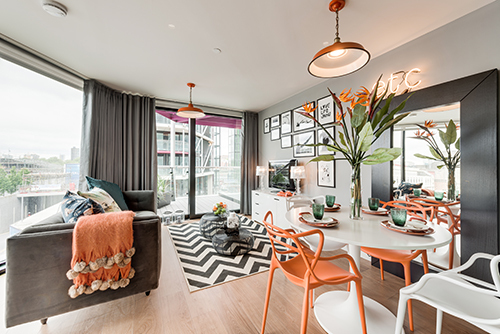 One of six eye-catching apartment buildings at St James ‘Riverlight’, 6 Riverlight Quay is set within the Nine Elms regeneration zone. The buildings all feature a wealth of glazing and stunning gull-wing roofs designed by Rogers Stirk Harbour & Partners architect, but only in 6 Riverlight Quay will you find 116 unique one and two bedroom apartments available for shared ownership. The one bedroom apartment on the first floor is one such apartment. Triangular in shape, it occupies the apex of this striking building. At 51.8sqm it is perfect for a single young professional, with more storage than you’d expect for an apartment of this size, and the added benefit of a spacious balcony. Offered for shared ownership sale, the 25% share was valued at £156,140, and the minimum deposit required was just £7,807. The total monthly cost has been estimated to be just over £1,100 – less than a similar apartment would cost to rent privately in the area.